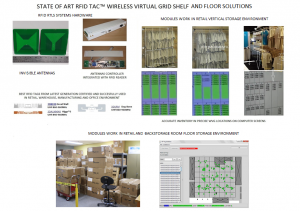 3DTAC Technologies Inc. is a company that designs, builds, develops and licenses its Patented Radio Frequency Identification Tag Access Control Real Time Location Technologies (RFID TAC™). The corporation was founded to address the market need for real time, real location (RTL) object/item visibility for passive UHF RFID tags. The RFID TAC™ technology has widespread breakthrough enabling application benefits for the Supply Chain Management, Consumer Goods and Brand Protection, Healthcare, Safety & Security, Defense amongst other business sectors. 3DTAC partners with leading providers, to integrate their patented 3D location technology and to offer state of the art solutions for real time asset management and real time item level inventory control. The RFID TAC™solution uses existing passive UHF tags and provides 99.9% reading accuracy covering wider areas than any current technology. 3DTAC patent overcomes issues of accuracy, signal collisions and multipath, making this technology a perfect fit for the management and control of large quantities of tags for enterprise scope of applications.